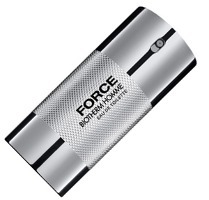 Biotherm has launched Force Homme, the line's first fragrance for men. The new scent is named for Biotherm Homme's Force Supreme anti-aging skincare line, which is currently fronted by actor Chris Noth. Force Homme is an aromatic, and features notes of citrus, absinthe, neroli, cardamom, sweet grass, patchouli and amber. You know, I’m always puzzled that perfume companies think it’s a good idea to link the concepts “strong” and “man” with the concept “smell”. Smells strong, strong-smelling man, man smells like a force of nature. . .
That ay be the butchest bottle I have ever seen: a chrome, knurled cylinder. This is what a bottle of Craftsman Man would look like. I wish CdG Garage came in a bottle like this. Agree on both counts! Reminds me of my weight bar. I find it astouding that Chris Noth is the “face” of any anti-aging line. Oof. Boy must have had some serious work done. It’s been a while since I ogled him last, but I did that aplenty at one point, and even then — heck, around his mid-30s, Law&Order days — he had bags under his eyes like sharpei puppies. Can’t comment, don’t know him well enough. SHAR PEI PUPPIES??? THAT IS PRICELESS! ROFL! well he is one fine slab of man, Louis Vuitton Steamer Trunks under his eyes or no… he can front ANYTHING (preferably Shirtless! LOL!) in my opinion! Well, it is better to have Chris Noth born 1954 then Justin Timberlake, or at least it is more realistic, isn’t it? This must be L’Oreal’s response to Zirh. Didn’t think Zirh sold so much as to require a response! It smells just as described. If you can imagine all the notes in sucession without much effort of the imagination hehehehe. The ONLY surprising note is the cardamom. It gets heavy on the cardamom as it dries down, as if the power on it goes up and down….It gets “unstable” and surges and dips… it smells like a synthetic when it gets this far. I really love cardamom, so I should try it, thanks!